If you’ve pulled a muscle, injured your back or are suffering from abdominal discomfort you’ll know just how great heat therapy can be in relieving those awkward aches and pains. Heat therapy works by promoting circulation and restoring oxygen to constricted muscles; this is why the warming sensation is able to alleviate that feeling of tension. 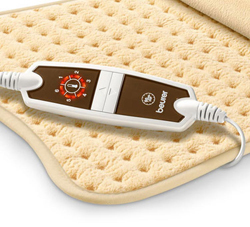 With Beurer’s HK 115 Cosy Heating Pad you can now get immediate targeted relief straight to the source of pain. Unlike a hot water bottle this comfy cape puts you in charge of the temperature with its six illuminated heat settings and rapid warm-up system. What’s more, you can enjoy continuous comfort much longer as its plug-in heat delivers constant warmth for as long as you like! The definition of cosy, Beurer’s Heating Pad is made with a super-soft and skin-friendly microfleece material. No need to sweat - you can enjoy that snuggly, comforting feeling without becoming damp or clammy whilst relaxing, thanks to Beurer’s breathable fleece technology. Beurer Heating Pads are great for delivering targeted heat wherever you need it for as long as you need it, but it’s the turbo heat function of the HK 115 that makes it that little bit special. If you get in from a long day at work and your back’s tense and knotted, the turbo-fast heating system will get you from cool to warm – quicker than it takes to boil a kettle! Why is the HK 115 better than a Hot Water Bottle? Are you a bit of a Goldilocks when it comes to your hot water bottles? It’s either too hot or too cold, and when you’ve finally cracked the heat - it only lasts a few minutes! Beurer have designed the HK 115 to be ‘just right’ every time as its 6 adjustable heat settings maintain your favourite temperature for up to 4 whole hours! With immediate turbo-fast heating and cooling, you’re sure to have a constant source of heat tailored to your needs throughout the day. Not only is it warm and cosy – it’s a whole lot safer than a hot water bottle too. Researchers at Anglia Ruskin University suggest that more people are suffering scalds from hot water bottles than ever before as they try to beat rocketing home heating bills. Beurer believes that safety is the most important issue when it comes to flexible heating products. That’s why their handy heat belt has a 90 minute switch off function if you forget you’re wearing it (or happen to doze off)! The tried and tested Beurer Safety System (BSS) uses electric sensor technology which prevents overheating in case of misuse - so if things do get a bit too hot under the collar, the sensors are always ready to turn the pad off. The HK 115 provides effective pain relief over the same area as a hot water bottle with added versatility; no more refilling and lugging it around, putting on and taking off covers, worrying about poorly-manufactured, perishable rubber and how much pressure you’re putting on it; just safe, hassle-free targeted relief whenever you need it most. This compact heating pad can be folded for easy storage and travel, making it ideal to take on holiday, when visiting friends and family, or even to work, when you know you'll need a little pain relief after long, busy days. What’s more, the HK 115 is completely machine washable; simply detach the power cord and put the whole thing in the washing machine! Fashioned with a form-fitting shape that can be wrapped or draped around your body, this super soft pad is great for people of all ages and sizes. Perfect for sleepy nights in front of the telly or reading a book, you can position Beurer’s Cosy Heating Pad anywhere you’re experiencing pain, or simply pop it on to warm your cockles! It’s so versatile and great for the whole family to use – from period pains and sports injuries to lumbar support and arthritis, everyone will want to try the Cosy Heating Pad! With the assistance of their modern, high quality products, Beurer are the ideal companion to advance your relaxation. Thanks to their great commitment and over 95 years’ experience in health and well-being, you can rest assured you’re in safe hands with Beurer.